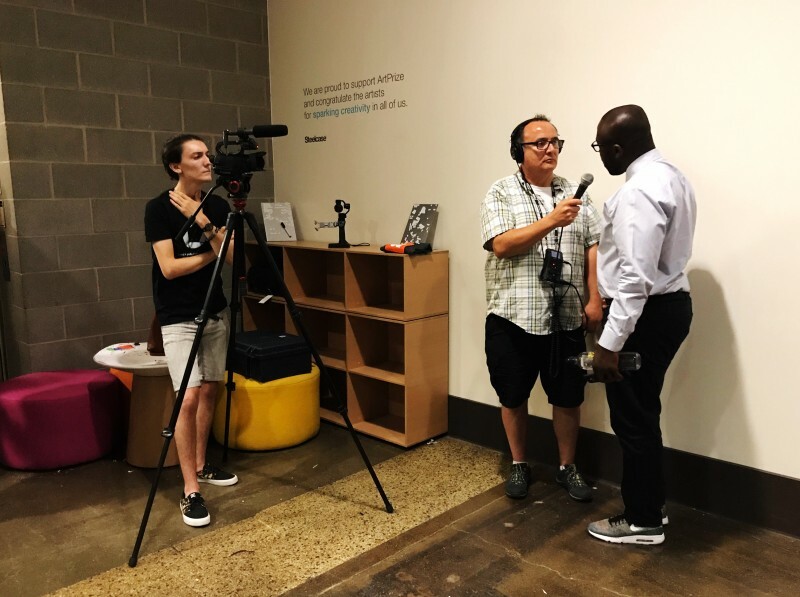 The Rapidian and GRTV interviewed a variety of audience members after the event to get their reaction with community journalist, Jim Moreno, doing the interviews and Brandon Cooley as the cameraman. Art lovers, hopeful artists and various media filled the ArtPrize Studio at the ArtPrize Hub last night on 41 Sheldon Boulevard SE, eager to hear whom this year's jurors' selected for notice among this year's entries. The Rapidian and GRTV interviewed a variety of audience members after the event to get their reaction with community journalist, Jim Moreno, doing the interviews and Brandon Cooley as the cameraman. Interviews include a community member, an Artprize volunteer and juror, a curator of a site and a former Executive Director of ArtPrize. New York-based independent curator and cultural critic Larry Ossei-Mensah talks importance of accessibility to art with community journalist Jim Moreno. ArtPrize volunteer and community member, Amy Norkus discusses how interesting it was to see jurors' picks reflect the current political climate including topics such as the environment and racism. A full list of this year's jurors' picks can be found here.